With just a few weeks left before Christmas, the holiday shopping season is flying by. If you’re trying to figure out what to get for an iPhone or iPod owner, here are 11 ideas to point you in the right direction. Apple’s portable devices are among the most popular gadgets in the world. Who doesn’t have some kind of iPhone or iPod at this point? That’s why you can’t go wrong buying a gift that takes that special someone’s iPhone/iPod experience to the next level. There are tons and tons and tons (am I making myself clear?) of accessories and extras on the market, which makes finding a place to start shopping in this category difficult. Look no further, MacYourself’s 2009 Holiday Gift Guide features great products just about anyone would enjoy. iHome makes quality products and has been a popular choice for iPhone & iPod owners over the years. This particular model is a clock radio that plays and charges Apple devices with superior sound quality. Who wouldn’t want to wake up to their own custom iTunes playlist? It’s the perfect gift for athletes and health freaks who own an iPhone, iPod touch, or iPod nano. One receiver is connected to the nano (the others already have it built in) and the second receiver is placed in the individual’s Nike+ shoe. Real-time data is then sent to the iPhone/iPod to track time, distance, calories, and more during workouts. Satellite radio jumped on the iPhone bandwagon earlier this year with their free App Store app (which requires an online streaming subscription). Then they took it a step further with this device, which serves as a car dock for the iPhone and iPod touch. It includes a satellite radio antenna so users can listen to exclusive content on the road while charging their Apple product’s battery at the same time. The worst thing about cases and protectors for electronics is that they add weight and cover up the device’s sleek design. An excellent solution to that problem is skipping the bulky cases altogether and applying a transparent film or skin instead. It improves grip, protects against scratches & filth, and comes off with no sticky residue. Is one of your friends or family members a world traveler? 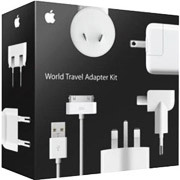 Staying connected while out of the country can be difficult, so Apple cleverly put international power adapters for all of their products in one convenient package. More of a stocking-stuffer than a real gift, this cable can take audio from any iPhone or iPod and feed it to other sources such as car stereos, home audio systems, and portable speakers. With talking on a cell phone while driving being against the law in many U.S. states, a Bluetooth headset is a smart gift idea for anyone – even if they don’t own an iPhone. For those that do, this is a well-priced option to allow them to talk hands-free on the go. While most people are just fine with them, the earbuds that come standard with iPhones & iPods are often criticized for subpar audio quality and falling out of the ear too easily. Apple’s new in-ear headphones, however, offer a better listening experience at an affordable price. It seems like a battery can never last long enough. No matter how much capacity improves with each product revision, we want more. This add-on for iPhones and iPods plugs into the dock connector and can effectively double battery life. Busy people who aren’t usually near power plugs will benefit greatly. Wouldn’t it be cool to hook up an iPhone or iPod to an HDTV and watch videos on the big screen? Movies, TV shows, and podcasts don’t have to be stuck inside that tiny gadget. Using Apple’s audio/video cable is an easy way to broadcast content from an iPhone/iPod to a TV – especially at a friend’s house. The previously-mentioned component AV cable is great for traveling, but not ideal for home use. At home is where a more permanent solution is needed. Apple TV is essentially a big iPod for the television. 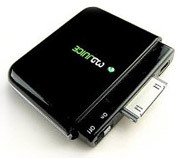 It can stream or store music, movies, TV shows, podcasts, photos, and more. Where it really shines, though, is instant movie rentals – right from the couch without ever touching a computer. Prices accurate as of 12/5/09 and are subject to change. Please note that some of the products listed above have not been tested by MacYourself. They are presented here for informational purposes and not necessarily as endorsements.